In this installment, I’ll look at another technique in the climate auditor’s toolbox, namely selective quotation. Once again, our example case study will involve accusations by Steve McIntyre concerning the use of paleoclimatologist Keith Briffa’s tree-ring based reconstruction in a key figure from the IPCC Third Assessment Report. Arguing from a cherrypicked selection of quotes from the “Climategate” emails, McIntyre has claimed that IPCC authors Chris Folland and Michael Mann pressured Briffa to submit a reconstruction that would not “dilute the message” by showing “inconsistency” with multi-proxy reconstructions from Mann and Briffa’s CRU colleague Phil Jones. Briffa “hastily re-calculated his reconstruction”, sending one with a supposedly larger post-1960 decline before. According to McIntyre, Mann resolved this new “conundrum” and simply “chopped off the inconvenient portion of the Briffa tree-ring data”. Jones and Briffa were concerned that Mann had an outdated version of the Briffa reconstruction, and both urged the adoption of the newer “low frequency” one, more appropriate for comparison with other multi-century reconstructions. Far from pressuring Briffa to change his reconstruction right away, Mann questioned whether an immediate change was required, or even possible, and counselled waiting for the next revision. CRU colleague Tim Osborn advised Mann that he and Briffa “usually stopped” the “low frequency” reconstruction in 1960, and went one better in his later “resend” to Mann, by explicitly removing the post-1960 data. I’ll also show how McIntyre has changed his narrative along the way , in an effort to prove that the true “context” of the famous “trick” to “hide the decline” is somehow an indictment of the IPCC. (Speaking of which, be sure to take the poll at the end about McIntyre’s next move). But first, once again, here is the cause of all the fuss, namely Figure 2-21 from Chapter 2 of the IPCC Third Assessment Report – Working Group I: The Scientific Basis (2001). 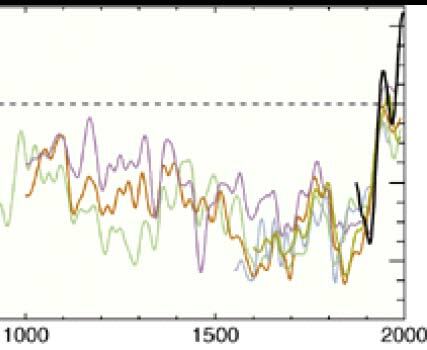 IPCC TAR Figure 2-21 showing four paleoclimatological reconstructions and instrumental temperature record. McIntyre has had a bee in his bonnet about this figure for a long time, as seen in a 2007 ClimateAusit post comparing Briffa and other IPCC authors to Martin Durkin of Great Global Warming Swindle fame. The restoration of the excised Briffa data is shown in green. In my opinion, the difference between the appearance of the altered and unaltered data is “substantial”. The alteration of the data makes the proxy reconstructions appear far more uniform than they really were. Not only was there no “clear explanation” of the alteration of the data, but the citation was to a reference where the data had not been altered. Can you imagine the hysterics if Durkin had done this? … In IPCC, no questions are asked about the professionalism of the authors. Briffa was appointed lead author of the section in AR4. Following the dissemination of the “Climategate” emails, though, McIntyre decided to shift his attack squarely onto lead authors Michael Mann and Chris Folland, while Briffa was portrayed as holding out, albeit briefly, against the “deletion” of post-1960 data in his reconstruction. McIntyre begins by announcing the true “context” of Phil Jones’s “hide the decline” email. Much recent attention has been paid to the email about the “trick” and the effort to “hide the decline”. Climate scientists have complained that this email has been taken “out of context”. In this case, I’m not sure that it’s in their interests that this email be placed in context because the context leads right back to a meeting of IPCC authors in Tanzania, raising serious questions about the role of IPCC itself in “hiding the decline” in the Briffa reconstruction. In fact, the email in question concerns Jones’s chart for a World Meterological Office report, but McIntyre was interested in tying this to the what he terms the IPCC’s “version” of the “trick”. McIntyre discussed the fallout from the first IPCC authors’ meeting in September 1999. The emails show that the late 20th century decline in the Briffa reconstruction was perceived by IPCC as “diluting the message”, that “everyone in the room at IPCC” thought that the Briffa decline was a “problem” and a “potential distraction/detraction”, that this was then the “most important issue” in chapter 2 of the IPCC report and that there was “pressure” on Briffa and other authors to show a “nice tidy story” of “unprecedented warming in a thousand years or more”. Soon after, I pointed out that that the main issue discussed was not the “decline”, but rather the lack of “low frequency” variation in the version of Briffa’s reconstruction used in the “zero-order” draft. I restored the missing passage from Folland’s email, thus demonstrating clearly the true situation. (In this and following excerpts, email passages omitted by McIntyre will be given in bold; the exchange between CRU scientists and Mann can be found here [May 24: Page numbers from the PDF of email exchanges have been added, along with archive email numbers. ]). After my post was brought to McIntyre’s attention, he shifted his story somewhat (resulting in a noticeable degree of incoherence). Comments from readers have clarified that the issue at the Arusha meeting was that the Briffa reconstruction “diluted the message” more through its overall inconsistency as opposed to the decline, which was still relatively attenuated in the Arusha version. After the Arusha meeting, Briffa hastily re-calculated his reconstruction sending a new version to Mann on Oct 5, 1999 and it was this hastily re-done version that introduced the very severe decline that was hidden in the First Order Draft and Jones WMO Report. In a subsequent comment, McIntyre referred to “a revised Briffa reconstruction that was bodged together and sent to Mann”, presumably in response to IPCC “pressure”. McIntyre also restored the missing quotes in the Folland email, but pretended this had nothing to do with the significant change he had been forced to make in the narrative. I know there is pressure to present a nice tidy story as regards ‘apparent unprecedented warming in a thousand years or more in the proxy data’ but in reality the situation is not quite so simple… [There are] some unexpected changes in response that do not match the recent warming. I do not think it wise that this issue be ignored in the chapter. However, Briffa also referred to his latest work, another key passage omitted by McIntyre. This is a broad hint that Briffa believed that some of Mann’s expressed reservations would be resolved by his updated “low frequency” reconstruction. Notice that this flatly contradicts McIntyre’s statement above that “everyone in the room at IPCC’ thought that the Briffa decline was a ” ‘problem’ and a ‘potential distraction/detraction’ “, a canard McIntyre half-heartedly corrected, but has repeated since, as I’ll show later. So yet again, Briffa suggested that his latest series would go some way to reconciling differences, as well as suggesting drilling down into the data for additional explanations. Emails the next day make it even clearer that CRU scientists wanted to ensure that the new “low frequency” reconstruction be used, and that this was key to resolving inconsistencies. Here’s Phil Jones responding to Mann a day later, in an email that has never been quoted as far as I know. This can only be interpreted as a “heads up” that Mann should use a more up-to-date “low frequency” curve, one to be finalized soon and presumably published well before the IPCC deadline. 1) I am definitely using the version of the Briffa et al series you sent in which Keith had restandardized to retain *more* low-frequency variability relative to the one shown by Briffa et al (1998). So already, the reconstruction I’m using is one-step removed from the published series (as far as I know!) and that makes our use of even this series a bit tenuous in my mind, but I’m happy to do it and let the reviewers tell us if they see any problem. If I understand you correctly, there is yet a new version of this series that is two steps removed from Briffa et al (1998)? Far from applying any pressure for a new version, Mann expresses doubt that such a version could be added in time to the imminent revision anyway and worries that it may be too far removed from the original reference. But, like Jones before him, Briffa’s main concern appears to be that the most appropriate (as yet unpublished) “low frequency” curve be incorporated. Thus, McIntyre’s contention that the “low frequency” reconstruction sent by Tim Osborne two weeks later was “hastily recalculated” under pressure from Folland and Mann can not be supported. Not only that, but Briffa explicitly stated (once again) that his latest work would overcome Mann’s reservations about inconsistency between the various reconstructions. Be that as it may, McIntyre’s current narrative, as given in his March 2010 presentation at the University of Toronto’s Trinity College [PDF 2Mb], returned once again to emphasizing the “decline” as “diluting the message”. He also accused Mann of unilaterally removing the post-1960 data. The Briffa reconstruction – with its late 20th century decline – was viewed by IPCC leadership as ‘diluting the message’ and being a potential ‘distraction/ detraction from the reasonably consensus viewpoint’ that they wanted to show. Briffa expressed reservations about the failure of the proxies to behave as expected and weakly urged that the issues not be ignored. …IPCC section author Mann resolved the conundrum. He chopped off the inconvenient portion of the Briffa tree ring data – the portion where it goes down – and tucked the end point under other data, giving a rhetorical impression of consistency. But this too is not supported by the actual emails. Consider Tim Osborn’s email of October 5, where he sends Mann the latest “low frequency” reconstruction. Keith has asked me to send you a timeseries for the IPCC multi-proxy reconstruction figure, to replace the one you currently have. The data are attached to this e-mail. They go from 1402 to 1995, although we usually stop the series in 1960 because of the recent non-temperature signal that is superimposed on the tree-ring data that we use. And there the matter stood until February 28, 2000, when Mann wrote to Briffa to obtain the latest version, presumably for a major draft revision. Briffa K.R. (2000) Annual climate variability in the Holocene: interpreting the message of ancient trees. Quaternary Science Reviews 19, 87-105. Osborn did send the same data, but with one important exception. So, once again, the accusation that it was IPCC lead author Mann who decided to “truncate the series at 1960” is clearly contradicted. Stopping the series at 1960 was the intention of the researchers all along, in conformity with their standard practice when comparing multi-centennial reconstructions in “spaghetti graphs”. Many scientists have complained, with considerable justification, that a selection of emails plucked from context according to some undisclosed criteria, will inevitably give a misleading impression. But the present review also demonstrates that many of the emails present in the “climategate” archive have been conveniently ignored in favour of a meagre selection of cherrypicked quotes marshalled to present a scenario diametrically opposed to the truth. To say the least, one should take the climate auditors’ version of “Climategate” with a huge grain of salt. How will Steve McIntyre react to new evidence contradicting his current “trick” narrative concerning IPCC TAR Fig. 2-21? I’ll be cutting off the poll on May 20, which happens to be two days after the Fourth International Climate Conference sponsored by the Heartland Institute. For the first time, Steve McIntyre and Ross McKitrick will both be in attendance, along with other luminaries featured in this blog, such as Alan Carlin and Chris de Freitas. This entry was posted in Climate science disinformation and tagged IPCC, Keith Briffa, Michael Mann, Steve McIntyre, TAR. Bookmark the permalink. Probably, but doubtful that she will admit or recognize that McI is at fault. It baffles me how intelligent people like Loehle and Curry can be so blind to McI’s modus operandi and his true agenda, even after is is repeatedly exposed by DC and She Wonk and others (e.g., Tim Lambert). As always, nice work DC. IMHO, your sleuthing is incredibly valuable. Please make sure that it does not disappear down a worm hole or into obscurity. Perhaps Judith Curry should read your exposés in some detail. Let’s see what happens with her emphatuation with Steve McIntyre. I’m afraid, though, that she’ll do the same as McIntyre is most likely to do: shift focus and start pointing fingers ago. Infatuation! Infatuation! Feel free to correct my English, DC. Urgh. That is a grade-A hilarious word. Or neologism, at least. Anyway, McIntyre looks reasonable to a newcomer sometimes, especially if they don’t dig into it, or see the considerable chunks of the story being left out. Maybe this is what happened to Curry. It really isn’t new evidence, is it? It’s been there all along. Given how much mileage he’s tried to get out of these emails, and how his compadre managed to write a book about it, and that he went out of his way to remove some context through ellipsis, it’s hard to imagine he hadn’t seen all this. I might be reading this wrong, but what’s funny to me is that McI would probably otherwise prefer Briffa’s newer series, because it shows more variability in the past, and sceptics prefer bumpier reconstructions. But there’s political mileage to be gained. Judith Curry may be “emphatuated” with McI, but others have likened McI to Martin Luther. You argue with facts, but others appeal to YHWH AND have the cheek to say that referring to peer-reviewed science and the IPCC is an appeal to authority. Judith Curry’s name seems to be coming up a lot. Here are her comments on the IPCC and the Trick post that I have critiqued above. Steve, excellent job on this. If anyone else has identified a different section of the IPCC FAR WG 1 report where you have concerns about the reliability and objectivity of the assessment, i would appreciate hearing about it. Lets face it, the CRU emails have opened up a Pandora’s Box of issues surrounding the IPCC. Clive Crook of the Financial Times writes that “The IPCC process needs to be fixed, as a matter of the greatest urgency.” In defending the IPCC process, the IPCC doesn’t seem to have caught on to the need to make the assessment process more objective and scientifically watertight. Unless the IPCC reflects on and works to improve its assessment process, it risks becoming irrelevant or even indefensible. On an unrelated issue, DC, I am not confident you are aware of the importance of getting all this work you have been doing out conspicuously to a large audience. Being a scientist type myself I have great admiration for folks like you having the patience for this ‘lawyerly’ work. You should be talking with people like the desmoggers. And with both top lawyers and top media/communications people. Both are relevant. The money should be found somewhere — don’t let this run into the sand. BTW I want to see Wegman dressed in orange. Very much. My quota of compassion was exhausted by the Times interview of Phil Jones. [DC: I believe it’s only a question of time before the mainstream media starts to pay attention to these issues. I have had received good support from DeSmogBlog and other such venues. Personally, though, I’m not sure there are grounds for criminal action against most of these actors, although a strong case could be made for investigation of certain Rebuplican staffers and their bosses. Don’t need grounds. Just need to find the Anticuccinelli. Wonderful word, utterly right for the perilous attachment to focusing on bits and pieces taken out of context and polished til they shine. I have a suggestion for your next poll: use this list of choices. B) I find what you said substantially different than what I was thinking. I’m glad to have this perspective that had not occurred to me, but I need to process it. C) I don’t agree with you but I see how we are generally in agreement, and I move on. D) I don’t like what you said, and I see your statement as something that should be corrected. E) I disagree with what you said, and I think you are doing harm to the larger causes with either the content or the tone, but I see your approach as part of a broad spectrum of which we are both part. F) I am alarmed and annoyed, and offended and angered by what you have said. I feel the need to tell you so, and to take a stand against your tone or to disprove your content, or at least, distract your argument away from its intended goal so that this horrible thing you are doing is derailed. Marco, you have – apparently accidently – invented a beautiful new word. It’s not the first time I used it (although I’m not the Audi lover), and hence should have known the word was wrong. I was corrected at that time by a native English speaker, who will probably blame me if this word enters the mainstream. I’m not masochistic, and she’s a tough lady…so please save me a whooping! I actually really mean “whooping”. She’s promised to chase me around with her battle cry. She’s got a sheep dog to do the actual work. It bites. I would love to see a video of a sheepdog chasing Marco around a field. DC, probably good odds that McIntyre will be giving his interpretation of the emails again at the Heartland shindig, so you might look up whatever he presents there. I don’t think that any kind of criminal investigation is either likely or appropriate. I think at most there could be an ethics investigation. However, I don’t think even that would be appropriate. I think the most appropriate thing would be for them to be judged boneheaded ideologues. Are we talking about Wegman-related affairs? That’s rather off the topic here, but I agree with pough. I don’t think any sort of formal investigation is appropriate, but I also encourage DC in further exploring the history and the text of the report. pough, I think you are just wrong. The only ones that will recognize the bone-headed ideologues for what they are, will be you, me, and the other readers of this blog, and some other blogs… nowhere near good enough. Didn’t climategate teach you anything? This needs to reach just as wide and deep as that. Blogging doesn’t cut it. It takes serious media professionals and serious resources. Without it, it will end up in the history books with President Kerry. The problem is that the nonsense just keeps on coming, and that many people actually fall for it. It will make any sane person cringe, so consider yourself warned. It easily fits in the wingnut ideologies, but it may actually also fool the ignorant(*) masses. And I mean “ignorant” in the actual meaning of the word, not its value-loaded meaning. Are you a lawyer, or have you discussed whether 18USC1001 might apply to the Wegman case? Note that I said ‘appropriate’. I don’t know if DC will have uncovered anything that could be interpreted as being illegal, by the time DC is done with this. If the scholarship in Wegman is bad, that should be explored and discussed. But threats of legal action in matters of scholarship – even if it’s work presented to Congress – I find that distasteful, probably counterproductive, and the sort of thing best left to the sceptics. It’s nice to see so many civilized people here… seriously. I stopped being one of them at least in this matter, for reasons I explained. Wegman isn’t even the worst of the lot… just another tobacco scientist. But he made the fatal error of misrepresenting his report under oath. If John Mashey is correct, that could mean prison time. Is anybody here seriously proposing clemency, after all that has happened? Get real. I found the report quite interesting until I saw the poll! Either vote something negative (all thre choices) about Steve McI. or don’t vote. John Mashey disqualifies himself with this act of bigoted stupidity. 1) I don’t consider acknowledgment of a clear error, or an apology, to be “something negative”. 2) I believe you have not been reading carefully enough. John Mashey is not the writer of this blog, although he has contributed many perceptive and informative comments on several of my posts. His [DC’s] point is only this – that the trick would have worked about as well even if the end of the truncated Briffa reconstruction hadn’t been tucked into a back layer. I will say that the full comment is a short clear summary of McIntyre’s “trick to hide the decline” accusation against the IPCC, which I may well quote in its entirety another time. For now, I will merely observe that I disagree with it in its entirety. Um, the first option is clearly positive — at least, admissions of error are lauded in the scientific community; perhaps your community has a different standard, and values piling lie on lie. Stop. Stop the ‘lawyer up’ talk. It aint going to help – not in the States. Its just wrong on multiple levels. I think this information needs to be assembled into a presentation suitable for ‘Congressional testimony’ when Congress calls together those ‘public hearings’ – not criminal hearings. And put on the shelf ready for when it is needed. Romm probably has a clue or two about assembling media packages. Getting it into the skepticalscience iphone app probably wouldn’t hurt. But – mostly – thank you for following the story. I’d like to move off the topic of possible criminal action, which is not strongly related to the topic at hand in any event. So I will accord myself the final word on this topic. 1) The most important task now is to gather and disseminate information as widely as possible. Issues and information I have brought forward are not being discussed in the mainstream press yet, but I believe it is only a matter of time. 2) In my view, discussion of criminal action is probably counter-productive and almost certainly premature, at least with respect to scientists and other academics or amateur researchers. On the other hand, I do think there is clear prima facie evidence of research misconduct that should be investigated, and co-operation with official politically motivated attacks on scientists raises additional issues that should also be investigated in a transparent manner by academics’ home institutions. 3) Inhofe’s threats and Cuccinelli’s initiative represent gross abuse of power and should be vigourously opposed. I hasten to add I am no legal expert, but as far as I am concerned the Barton investigation, including the actions of Republican staffers like Peter Spencer, remains the most fully realized example of such abuse of power against climate scientists . I believe a judicial investigation of some sort may well be warranted in their case, after emergence of all available facts (and, yes, there is more to come). Now please let’s move on. I’m sure there will be opportunities to explore these issues further another time. Thanks! Nice work once again, DC! FYI there’s something wrong with the url for this post. (see para. 21 in the appendix). I think the inquiry is still accepting evidence. Submitting a rebuttal to that posting would be a good way of bringing attention to McIntyre’s antics. Not a bad idea, but I’m not sure DC is willing to give up his anonimity just yet. Maybe John Mashey is willing to do this? I’m sure there must be a way of submitting something and preserving DC’s anonymity (even if it might mean using a third party). McIntyre shouldn’t be allowed to get away with submitting his selective ‘evidence’ to Muir Russell. Apologies for mangling my own ID in my original posting. Just a passive but regular reader saying thanks for all the good work you’ve done so far. Very appreciated. Hide the decline! Hide the decline! Hide the decline! However, let us observe that the scientists certainly knew what was in the emails, so could well have told the reviewers. a) Wish to actually give input to influence the panel. b) Get a comment out so it can be referenced publicly and propagated around. Well done DC. There’s a real need to scrutinise the antics of the, so called, ‘auditor’ and expose the concerted campaign of character assassination that he is persuing, for exactly what it is. “… the remedy seems obvious: If people only thought enough about the issues at hand, considered all the relevant information and employed proper reasoning strategies, their decision making would surely improve. This assumption is at the heart of numerous strategies that attempt to debias human judgment (for a review see Larrick, 2004); it is likewise central to public information campaigns designed to dispel erroneous beliefs and to replace them with more accurate information (for a review see Rice & Atkin, 2001). That’s the good science on teaching science — it doesn’t work the way you think ought to work. On the obvious side, it suggests that frequent repetition of the information that one wants to convey to the public is a good idea. All information campaigns attempt to do so, although usually based on the assumption that frequent exposure facilitates successful learning and message retention (McQuail, 2000; Rice & Atkin, 2001; Tellis, 2004). From a metacognitive perspective, frequent exposure also facilitates increasingly fluent processing of the message and increased perceptions of familiarity, which, in turn, increase the likelihood of message acceptance. Rhyming slogans and presentation formats that facilitate fluent processing will further enhance this effect. On the counterintuitive side, this logic implies that false information is better left alone. Any attempt to explicitly discredit false information necessarily involves a repetition of the false information, which may contribute to its later familiarity and acceptance. Although this problem has been known since Allport and Lepkin’s research (1945) into wartime rumors, the idea that false information needs to be confronted is so appealing that it is still at the heart of many information campaigns. Like the debiasing strategy of “consider the opposite”, it derives its appeal from the assumption that judgments are based on declarative information—and it fails because it underestimates the power of metacognitive experiences. Once memory for substantive details fades, familiar statements are more likely to be accepted as true than to be rejected as false. This familiarity bias results in a higher rate of erroneous judgments when the statement is false rather than true, as observed in the present study. On the applied side, these findings illustrate how the attempt to debunk myths facilitates their acceptance after a delay of only 30 minutes. In sum, providing participants only with the facts had the intended effects on participants’ attitudes and intentions, both immediately and after a short delay. Attempts to inform people that a given claim is false may increase acceptance of the misleading claim. In addition, such attempts may also have the unintended effect that the false claim is eventually associated with a highly credible source. Because messages from high credibility sources are more influential, as known since Hovland and Weiss (1951), this will further enhance the acceptance of the false claim—including its acceptance by others, who are told that one learned it from a credible source. Next, participants learned that some statements were taken from the National Enquirer (a low credibility source) and some from Consumer Reports (a high‐credibility source). Their task was to guess which source had originally reported which statement. As predicted, a given statement was more likely to be attributed to Consumer Reports than to the National Enquirer the more often it had been presented. Thus, frequent exposure does not only increase the acceptance of a statement as true, as reviewed above, but also facilitates the attribution of the ‘‘true’’ statement to a highly credible source. This source attribution, in turn, may increase the likelihood that recipients convey the information to others, who themselves are more likely to accept (and spread) it, given its alleged credible source (Rosnow & Fine, 1976). These examples suggest that countering false information in ways that repeat it may further contribute to its dissemination by associating the information with a credible source, either through source confusion or through erroneous inferences of source credibility. In most cases, however, it will be safer to refrain from any reiteration of the myths and to focus solely on the facts. The more the facts become familiar and fluent, the more likely it is that they will be accepted as true and serve as the basis of people’s judgments and intent ions. So, now what do I do about my “Global Warming Misinformation” page? Ugh! Marco, that link to Green and Armstrong is utterly astonishing. These guys are claiming a long list of known problems isn’t real, and so global warming can’t be real either. And who did they ask? The Heartland conference people and a septic Google group and such. Talk about rebunking, this one includes the lies about DDT and Rachel Carson and a whole passel of industry PR bunk. [DC: Those names are familiar. Yes, Green & Armstrong were also the ones who claimed the IPCC violated just about all aspects of forecasts, based on information about GCMs fed to them by ‘skeptics’. I honestly don’t know whether the piece I linked (Ed Darrell linked to it on Coby Beck’s blog, so I don’t take any credit for finding it) is evidence of extreme confirmation bias, or a very good example of how scientists are fooled by letting themselves be informed by crackpots. It’s probably a mixture of the two. 2. The banning of DDT (remember, the US was the first to ban DDT, in 1972) is linked to the increase in malaria in Sri Lanka…in 1968/1969! 3. Apparently, the US has a LOT of climate scientists, since Green & Armstrong claim 31,000 US climate scientists signed the “Robinson” petition (that would be the OISM petition). Facts are that there were about 200 on the list whose line of work was related to climate science (which is not the same as “climate scientists”), several of which later indicated they no longer agreed, and some others indicated they signed based on cursory information (as in “duped by the PNAS layout of the paper”, or signing because a friend asked them to). It’s sickening, but unlike DC’s excellent work does not need much digging to debunk. Armstrong, J.S., K. C. Green & W. Soon (2008), “Polar bear population forecasts: A public-policy forecasting audit,” Interfaces 38, No. 5, 382–405. See also the authors’ response: Amstrup, S. C. et.al (2009), “Rebuttal of “Polar bear population forecasts : A public – policy forecasting audit,” Interfaces, 39, 353-369. (We were not invited to respond; you can draw your own conclusions). Well, McIntyre isn’t a scientist. Could you explain your reasoning behind this claim? [DC: Mann had expressed reservations that the initially displayed series (from the zero-order draft) differed from Mann et al in the “opposite direction” from that of Jones et al, as I previously explained at length. In response, Briffa refers to “the latest tree-ring density curve ( i.e. our data that have been processed to retain low frequency information) shows more similarity to the other two series“. The other two series with which Briffa’s new series agreed better are, of course, Mann et al, 1999 and Jones et al, 1999 (which I have added to the quote to make the point even clearer). Briffa goes on to refer to an earlier low frequency series and comparison with other series in his previous Science piece. Again, all this is old ground that was clearly explained back in December. But rereading the passage, I would have to say it’s *more* than a broad hint. Briffa is being pretty definitive here. In the zero-order draft, Briffa’s “high-frequency” reconstruction was not just warmer than the other two almost throughout, but it showed almost no centennial-level (or greater) variance. Once again, that “lack of multicentury time scale variance” was the problem explicitly being discussed, not the decline at the end of the instrumental period. McIntyre’s account is completely wrong, and once again ClimateAudit is shown to be an unreliable source of information. Which is precisely how the Teletubbies and Sesame Street got the message across to the kiddiewinks. Hank, is “rebunking” a neologism or have I just missed it up until now? Its meaning is instantly obvious. … and down we go to comment # 58 (and 60!). Now as an exercise for readers (and to bring it back on topic), who can point to very recent “rebunkings” of McIntyre’s IPCC “trick” to “hide the decline” narrative (aside from McIntyre’s own of course)? Hint: There are examples in at least one European newspaper, and two relatively prominent blogs. Well, well, well. Here is a reply from Steve in which he makes clear the things that he only “hinted” at in the associated post. Could you please provide the Climategate email numbers so it becomes easy to read the relevant emails? I did provide a PDF of the email exchanges discussed, and have now added page numbers within that document, as well as archive file names (“email numbers”). Thanks Deep climate. I’ll read the emails directly from your pdf. It is difficult to search for specific emails in any of the sites from where it is available – something or other is whacky. I think there are some problems with your recent part 2 version of the story. I already talked about it at deltoid. I’ll try to post later explaining my position. Meanwhile let me also tell you – you identified the Folland email’s general thrust of centennial variability correctly, unlike McIntyre. But no matter, I do think he addresses many issues correctly – which I’ll try to explain. Check out Scott Sabol’s World of Weather and Science for posts on the loop current and its effects on the oil spill and hurricanes as well as other weather and science related items. Would be nice if you or even Steve could lay out the e-mails in chronological order so we can read and make up our own minds. [DC: The PDF I supplied above contains every available email between Mann, Jones and/or Briffa over the period in question (May 1999 to February 2000). To obtain this sequence I entered Mann in the East Anglia emails search box and then started looking at each and every email. That’s how I discovered the emails that McIntyre left out. I have also placed them in chronological order (the repository has them out of order because of incorrect handling of time zone offsets).